Don’t keep going around in circles looking for relief. We have a chronic sinusitis treatment just for YOU! When over-the-counter remedies and prescription medications fail to resolve your sinus miseries, Dr. Monty Trimble has the diagnostic technology, medical expertise, and treatment skill to find the solution. Let us take that misery away. Trying to stay awake every day after interrupted sleep every night is no way to live. Snoring and sleep disorders can rob you of energy, health, productivity and friends. Don’t put off finding the way back to a healthy, restful night’s sleep. Hearing loss is invisible, but its effects can devastate your world. Visit Dr. Erin Hattey, AuD, in our convenient, comfortable offices to unlock the reasons behind your hearing challenge. Bring your surroundings back to life. When the face in your mirror has lost the youthful appearance you remember, aesthetic injectables are a perfect solution to reverse the aging process. Take a look at the top line of aesthetic injectables we offer to give you a great look. If what you thought was just cold is still hanging on, and those antibiotics didn’t resolve your sinus pressure and drainage, your symptoms might be due to something more than a cold. You might be struggling with chronic sinusitis. Why Consider Southlake Sinus & Snoring – Trimble ENT? Difficulty breathing, chronic sinus problems, and sinus headaches are very common symptoms that require careful diagnosis to determine the best treatment for each patient. Snoring can turn your sweet dreams into nightmares. Whether it’s you or your partner that snores, there’s no need to lose sleep and risk damage to your health any longer. You need the right doctor for the right diagnosis and the right treatment - a Board Certified Ear Nose & Throat specialist like Dr. Monty Trimble. Dr. Trimble is one of the most experienced Balloon Sinuplasty In-Office specialists in the country. 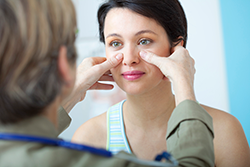 Sinus discomfort can last indefinitely unless the underlying problem is treated. If your sinuses don’t drain properly, your symptoms will usually return. You will start over with the congestion, stuffiness, pressure, headaches, fatigue, and on and on. Technological advances now provide a minimally invasive procedure that Dr. Trimble can perform in the office to solve many sinus problems. This revolutionary procedure is called Balloon Sinuplasty (balloon sinus dilation). Balloon Sinuplasty is quick and involves little or no discomfort or recovery time. It offers rapid, long lasting relief with a convenient and easy procedure. Patients get a more satisfactory result without cutting and without the cost of a hospital visit and operating room. My recovery was not long and in subsequent visits, I was released in three months. I am happy to report I have not had a sinus infection since December 2012. I am glad I had this procedure and the positive change it made. I commend Dr. Trimble and his staff in the office for their care and support. - Barbara F.